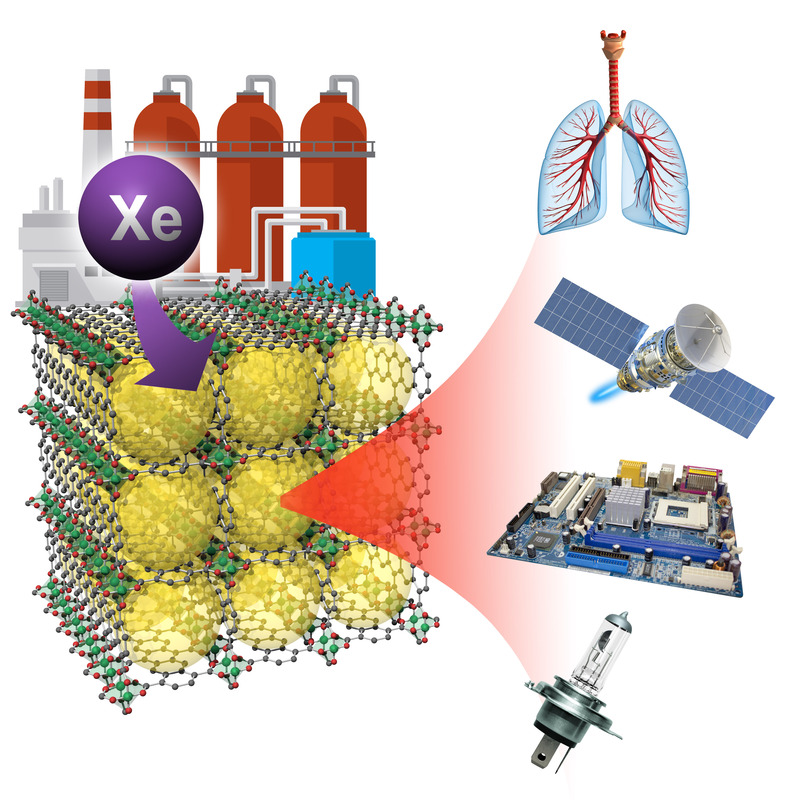 Metal-organic frameworks, with nanopores and a high affinity for xenon, can separate the gas from air or waste streams. Xenon has applications in various fields including lighting, space propulsion and medicine. Image courtesy of Pacific Northwest National Laboratory Enlarge Image. From space propulsion to lighting to surgical anesthesia, the applications and needs for xenon gas are growing. And the good news is that researchers are advancing the science to more easily remove xenon from waste streams and collect the low amounts of it found in the atmosphere. Researchers at DOE's Pacific Northwest National Laboratory are at the forefront of research developing porous nanoscale materials to capture xenon. They report in the journal Chem that inexpensive materials called metal-organic frameworks have been very successful in separating the gas in a way that may make it far less expensive than existing means of producing it. Currently, industry uses a common but expensive process called cryogenic distillation to separate xenon from other gases or the atmosphere. In that costly process, a lot of energy is used to chill entire gas streams down to far below freezing to concentrate the xenon. "The process we've demonstrated to selectively trap xenon in a MOF can be done at room temperature," said Dr. Praveen Thallapally, a materials scientist at PNNL and a corresponding author on the paper. "You pass a mixed gas stream over the MOF materials just one time to capture the xenon and it can be stored long term and easily released for industrial applications when you want to use it." Xeon also has applications in lighting, flash lamps, arc lamps, radiation detectors, medical imaging, research imaging with nuclear magnetic resonance spectroscopy, semiconductors, lasers, space propulsion, the search for dark matter and nuclear processing.